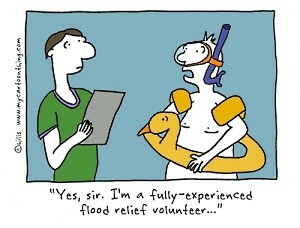 Take the time to research and choose the right volunteer organization. Because it's the right thing to do, because it will make you a better person. But there are other reasons too, if you choose wisely. I started volunteering at my local synagogue at a very young age when I could not have cared less about job search. ALL donated, volunteering time is never a waste. Being active as a volunteer is a great way to meet people and discover things about yourself that can then lead to new career directions and job leads. However, only if you have specific goals in mind, can you then get the maximum benefit. Volunteer at the place that will most help your personal brand and job search goals. If your goal is to be recognized as an expert, share your expertise at a local chapter of an industry association, chamber of commerce, or writing op-eds or blog posts for that association. If your goal is to be recognized for a specific job, offer your services in that role for a large charity that highlights its volunteers on its website, for example. A volunteering position should appear on your resume just like any other position, and not all roles are equal with regards to your brand. Which role will enable you to make best use of your skills AND provide great benefits to the organization? That combination is key to being a successful volunteer and getting recognition for it. This is a tough one, I admit it. Just like when you get hired for a job, you'll rarely be offered a choice of who your boss would be. Rather, just like when you job search, before joining an organization, spend some time learning about the people whom you would likely work with and understand how they could help you in the future. An (older?) well-connected supervisor would be preferable to someone who's also just getting started in the organization. As part of the organization, who are the people or other organizations that you will spend your volunteer time helping? Look for a role where you will get to interact with recipients directly so that people can learn about you & your work both inside AND outside the organization. This is more relevant in some cases than others. The idea is that some organizations have busier times of year than others, are only active seasonally, etc. Another angle is to consider- can a volunteer organization enable you to get into an otherwise inaccessible event? Do what it takes to be in the right place at the right time. Subscribe to JobMob via RSS or email and follow me on Twitter for more ideas on good deeds that lead to good jobs. – working your way up the ladder at a regular company might take time and patience. Many time, you might be working at a small branch of a non-profit in which someone serious with ambition can ‘get promoted’ quicker. You can then use that increased status to show other potential employers. – many times, low-level employees might not be involved in managerial positions and lack the ability to get them. Volunteering at a non-profit may allow one to get experience at managing other people. – volunteering affords you the opportunity to meet and work with people in some of your spare time, time which might be otherwise wasted on just regular entertainment (tv, movies, surfing). I love to volunteer and doing it to gain work experience was something I had enjoyed doing. Unfortunately, it has become another obstacle for me. Without a job, I cannot pay for the gas to get to my volunteer job anymore. Very good idea.I always love to volunteer it give me one of a kind happiness. Careful with volunteering companies. It can often be a way of exploiting good-hearted people for free labour.